Pokémon Sword & Shield (ポケモン剣盾) is a nickname given for the games Pokémon Sword and Shield. Pokémon Sword and Shield are the newest games in the Pokémon series, scheduled to release in Winter 2019. The games take place in the Galar region and at the start of the journey, players can choose one out of three Pokémon, namely Grookey, Scorbunny, and Sobble. New Pokémon will also be included in the games. The new worldview has created a buzz on the Internet! The games Pokémon Sun and Moon, which were released in 2016, are set in the Alola region, which consists of free islands that resemble those of the southern countries. The settings of the upcoming games, however, include towns where nature and industry are flourishing and coexisting, and they closely resemble Great Britain. People are also talking about the main characters, who appear tall and are clad in autumn-winter attire. The games have also gained remarkable popularity on pixiv, with three keywords related to them occupying the top 10 most searched keywords among men and women. 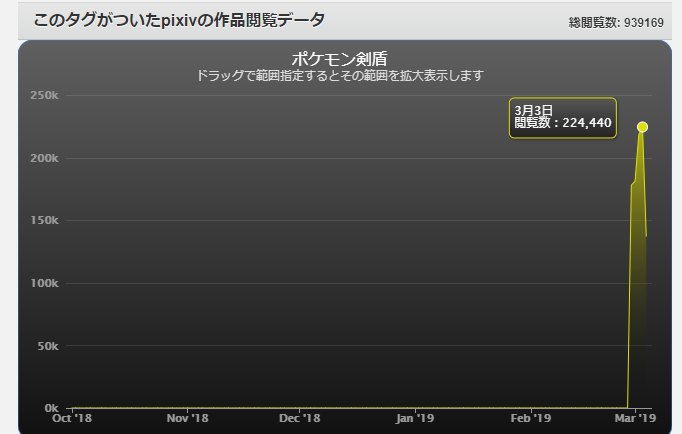 ▲ The number of views on pixiv as of March 4, 2019 (Source: pixiv Encyclopedia). Introducing illustrations of Pokémon Sword & Shield!